....Queen City Summit, Highway 375, 3 September 1999: Two deep red Gas Guzzlers zooming out of Sand Spring Valley, thundering all the way down to Railroad Valley. Screaming thru the curves, slamming on the brakes: Those ruthless joint Swiss-American Exploratory Troopers are at it again! This time, they are after Reveille Peak (8910 ft.), to check out the possibilities of Extreme Desert Base Viewing at its top. "American Woman/listen what I say....got more important things to do/than hang around with you.../American Woman, I gotta get away...". Lenny Kravitz and the recent adventures in New Mexico pop up in our mind. What will the hours ahead pour upon us in terms of surprises? Will we survive the cruel, exasperating hike to finally mount the flags atop of that rock in the darn lonely high desert of Nevada. Distracting thoughts, eyes to keep on the road being swallowed by the hood. Area 51 Viewers Guide by Glenn Campbell, edition 4.01, printed 8/9/95, hand-signed copy no. 5102, page 50: "NY 43.6: Maintained, well-travelled, 2-lane dirt road S leads 8.2 mi. to the abandoned Cedar Pipeline Ranch and 5.0 miles beyond to the Cedar Gate of the Nellis Air force Range. You can see the entire road to the ranch, gate and Cedar Pass in the distance." Dirt road. D-I-R-T? Wait a minute: The two Breezers pull over at the stop sign. Doors open. Sturdy Swiss Raichle Hiking Boots and US Nike Sneakers simultaneously step on a blacktop. Black as black can be. Leading all the way to Cedar Gate. Swiss Mountain Bat: "That thang was not here last October, when T-Bird and I came by, on our way to TTR. Did you notice the vegetation groth on the bladed ditches? Wasn’t here either. They must have built this in late spring." Navigator: "Yeah, that’s just what I thought, too". Even more: The road seems widened. To allow the Men in Blue stealthy trucking of big stuff right in and out of the Range, back and forth to HWY 375, thus making full use of the valley’s seclusion? Much more quiet a place than the publicity-haunted Groom Lake Road, but sure. The Cedar Ranch and the waterhole. A few cows standing in the water, gazing at the two 4WDees swirving off the blacktop on to a sandy dirt road towards the corral and soon disappearing in skyhigh clouds of dust. Reveille Peak. Dark, proud and breath-taking mountain dominating Railroad Valley. After a few miles, the leading Dirthugger’s brakelights flash up: Time for some map work: Navigator (nomen est omen) stakes out a place suited for a basecamp: Aim at that lonely Juniper tree in the distance, then hang a right, creeping up the slope till ya can’t go no moah. How to find a decent parking lot for a subsequent dash to the peak and not ruin your vehicle on the way there. As easy as that. With eyes become slits, the intrepid ones buckle up and turn their motors into wild howling coyotes. Westward, ho! After 30 minutes, the vegetation gives way to bigger bushes and small trees. Blazing thru the prairie, they gain ground swiftly, making smaller bushes disappear underneath their machines. Look out, trees ahead. Trees? What trees? Gotta find that camping spot, no time to worry about trees now. Cactus, avoid that cactus. Down the ditch, up again, just to find us stranded in front of a barrage of large brown rocks. Backtracking again, to search for the right path to glory. Back and forth again. Life-like. So we creep on along that slope, leaving behind deep tracks in dry grass. Initializing the Freeway to Reveille Peak Basecamp. The sharp rock was hidden behind a bush. Invisible to humans. Hit the son of a gun way hard. Nuttin’ damaged underneath of our Explorer, but took a few minutes to get off that obstacle. And lesson well learned, of course. After sneaking up a dry creek the zig-zaggin way, the Prairie Blazers finally stop at a wind-protected spot close to the base of the mountain, as close as one can reasonably get. It took us about 90 minutes for that Extreme Desert Rallye up here. The sun already low, we postpone our plans to storm the peak to next morning and swarm out to gather wood for starting one of our world-known bonfires. Dinner time. Tons of calories get bunkered for the sportive challenge waiting for us in a few hours time. But rolling thunder of jets in the distance remembers us about the noisy fact that we are sitting right under a Military Operations Area (MOA) called Coyote Charlie, with restricted airspace R-4807 and its EC East hidden behind the peak and 74 B over Kawich Valley, all the way south of our place. No wonder then that the following hour is one great dogfight over our necks, with pairs of B-1s in low level flight dashing towards Quinn Canyon Range and Humboldt National Forest to disappear in Reveille MOA. F-16s chasing each other seem to get entangled in invisible spider nets, merciless, loud and rumbling. In the meantime, Steve, world-renowned Groom Lake photographer who he is, indeed, has unraveled Big Momma out of the depths of his Nissan. BIG as big can be: A 2000 mm refracting telescope on a shining tripod out of polished aluminum. What a beauty. Awesome looks thru the eyepiece, trying to catch a glimpse of what’s going on over the dry lake bed close to HWY 375....ah, even more F-16s down here...one soars skywards, levels out and does the victory roll. The night creeping upon us, the closer we move our lawnchairs to the fire. It’s the hour for wild Interceptor storytelling. Goosebumps, huh. And the milky way stretching its shining banner thru the darkness. Did you know that in Australia, the Aborigines do not look at the stars and their configurations as such, but merely at those black spaces between them? That’s where they see huge lifeforms like lions, for example (but no slim-figured aliens, sorry). Interesting way of admiring the night sky, I must say. The flames die slowly, allowing us to lean back and do some stargazing. Actually, a lot of it, thanks to Miller beer. There, shooting star! But that was a strange trajectory, wasn’t it? Ghost Hour approaching. Sleeping bag acting as a cover. Spending the night inside your Expedition Vehicle (EeVee) does have its preferences. Only Navigator sleeps in one of those nifty high tech tents (built up in seconds thanks to leightweight materials). So no wonder then that Steve and I had lots of possibilities to de-crinkle ourselves the following day. 4 September 1999, 06:00 AM: Wake up. Snickers, bananas, peanuts, water, carrots for breakfast: We will evolve to be slim’n’thin after this trip, ha. Packing the rucksack, leaving the heavy Canon image-stabilized videocam behind for some more water. Water will be crucial on our way up. 07:10 AM: Up, up and away: Navigator takes the lead. Last looks back. For the next 270 minutes, ours will be sweat, heat and grinding teeth. The way up the giant rock by zig-zagging its eastern scree-loaded slopes. One foot up, two feet back. Not many words spoken during the ascent. Sun burning down on the neck, making you feel like in the midst of hell. After about two hours into the hike, we reach a place to rest high up on the southern ridgeline, allowing us to peep down the other side towards Kawich Range and Reveille Valley. The latter’s dirtroad rejoins HWY 375 at NY 0.8, after about 43 miles from Cedar Ranch. Remnants of a fire. So we are not the first ones up here. Half a gallon of refreshing water powers our bodily circuits up again. With Big Momma stashed away in his tower-high rucksack, Steve carries the heaviest load of all three of us. His black cap with its Groom Dry Lake Test Facility patch like a beacon between the beige rocks. There is the peak looming up there, let us get it on: Another two and a half hours of Extreme Desert Hiking ahead. ...Breathless. Sweat, sun and swearing. We have to take evasive action due to that dense forest blocking our line of attack. Eroded nerves, grinding teeth. Geeze, this hike really deserves to be ranked five Tikaboos, with a dire warning label attached: Do not try this one alone, or you will enter Eternal Hiking Grounds!!! ...You shake my nerves and you rattle my brain/too much of you can drive a man insane/you brake my will, but what a thrill: Goodness Gracious Great Balls of Fire! Jerry Lee Lewis could not have expressed our feelings better: Around 11:40 AM, we finally reach the peak. Debris of a smashed wooden target all over the place, similar to Tikaboo. A few bushes. And a metal USGS marker, too. The Stars and Stripes together with the Swiss White Cross on Red Ground get raised, hurrah. We made it! Proudly walking the place in church-like silence, heads up high, sunburnt: Red daredevils on black mountain heights. After only a few minutes of rest, it’s all Interceptor business again: Our tripods dominating the spot. Big Momma is up first. Facing Groom AND Papoose Lake. Right, two dry lakes being simultaneously visible. Now this is not some Copperfield-like magical ticky-tacky trick, THIS IS REAL: Visible from left to right: Bald Mountain, the southern end of Groom Range, Groom Dry Lake with its two runways in direct line of sight, base buildings, the Papoose Range and - Papoose Lake. Groom AND Papoose Lake on one picture. Sensational. ANOTHER GREAT AREA 51 VIEWPOINT. And another world-wide photo copyright for both our US Allied Forces, Southwestern and Eastern Division HQ as well as Batwing CMD of Switzerland - European Headquarters of the Interceptors high up in the Swiss Alps. Just too bad it is Labour Day weekend. Otherwise, Groom’s pilots would have come streaking straight towards our noses. Even more, we could have been looking right down on them. Interceptor Heavens, indeed. The hike back down to our basecamp takes a terrible toll on our knees and shoes. Makes us almost screaming at the scree. But to no avail. The mountain strikes at us with relentless brutality one last time again. Stones treaded loose turn into dangerous avalanches, bringing woe to those unexperienced ones walking too close to each other. After 210 minutes of watching step... by step....by step, the basecamp appears in the distance. Save havens for the three thirsty, hungry, heavily scratched and dusted ones. A descent to remember. And great camaraderie, too. That is what makes all those hikes so outstanding ones. Three portions of Swiss soup containing those faked meatballs load our batteries again. The second bonfire at the slopes of Reveille Peak, but not the last one, rest assured. Mucho laughter, high reaching flames and spirits thanks to the great success. We skip stargazing this night for some Extreme Desert Snoaring. 5 September 1999, 10:00 AM: Wake up call. Devouring of the remaining food rests. We stick our heads together to brainstorm another aluminum postcard (size: 16x10 inches!) to Groom’s Inhalation, er, Installation Commander. 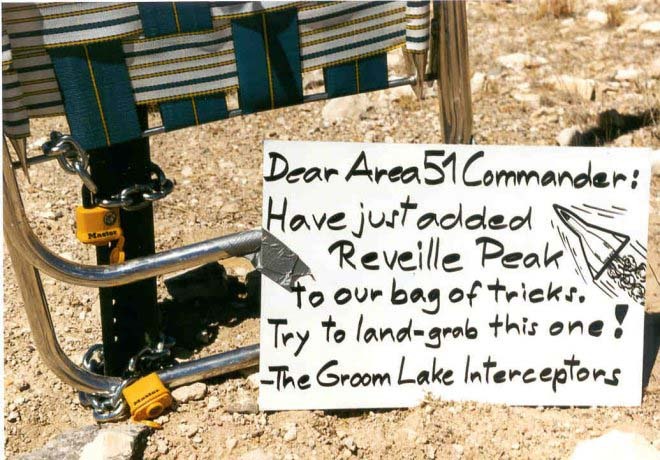 "Dear Area 51 Installation Commander, Have just added Reveille Peak to our bag of tricks. Now try to land-grab this one. --The Groom Lake Interceptors". The backside proudly states: "...Always around when you expect us the least". We pack up and get 4Wdeed again, with the sun warming our cold rattling bones. Bump-a-bump: We highly recommend to enter R-Peak Freeway with high clearance 4WD vehicles only. Do not try this with your Mustang or Hyundai, you would wreck it up but good. Upon reaching Cedar Ranch, we decide to name the blacktop towards the restricted border INTERCEPTOR HWY. And baptize it accordingly: A ceremony full of living colors, so to speak. Next stop for the three of us is Rachel, where we inform the Area 51 Research Center about what whe have just seen and gone thru a few hours ago. We buy lots of souvenirs (Glenn, gorgeous Groom Lake Yacht Club shirts, those!) and say good-bye. But our adventure is not over yet: We roll down to Groom Lake Road and place our postcard for Area 51 Infestation, er, Installation Commander right to the 45 MPH sign, together with our beloved lawnchair. And make sure that no one can steal the chair: Three MASTER-locks come in handy for that purpose. Lawnchair chained to 45 MPH speed limit sign at Groom Lake Road, plus loveletter by Interceptors "AF-2", "Navigator" and "Swiss Mountain Bat" to the Installation Commander (actually, it's a spray-painted sheet metal piece..), 9-5-99: The shiny thing put up by us right after our Reveille Peak Experience survived the entire Labor Day weekend, untouched by the Cammo Dudes for three consecutive days, imagine! In the afternoon of 9-7-99, upon checking out Groom Lake Road again prior to dusting to Tikaboo Peak Basecamp, the sign was gone. But those footprints around the speed limit sign.....people by the dozens apparently took notice of it! It's time for us to get HWYborne again: While Navigator disppears in a cloud of dust towards a horizon shimmering with heat, Steve and I head down towards the restricted border. But no surprises this time. Just dust, blue skies, Cammo Dudes. And those remotely controlled cameras leering down on us from the ridge nearby.